In the original liner notes from 1998, drummer Bertram Lehmann notes: For Fernando Huergo, musical diversity doesn't come as a surprise. For all he remembers growing up in a musical household in Crdoba, Argentina, surrounded by music that his father, a professional singer, pianist and guitarist would encourage him to check out. I was singing Chega de Saudade when I was about two years old, with my parents and uncles passing around instruments and singing," says Fernando when asked what sparked his love for music. He would hear tango, classical music and Argentinean folklore, discovering jazz and Brazilian music by sifting through his dad's extensive record collection. At age eighteen his emerging talent had earned him a teaching position at a local conservatory, and a few years later he moved to the U.S. to attend Berklee College of Music in Boston, where he also currently is on the faculty. Here's where the music gets mixed," he comments on the importance of coming to America. People are very open, still respecting the tradition, but then taking the music to another level." 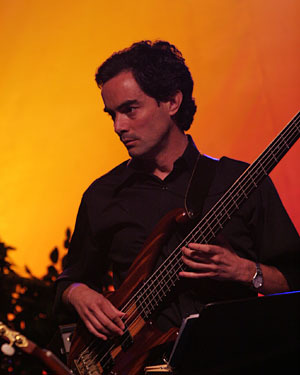 Citing inspirational sources such as Ray Brown, Andy Gonzales, James Jamerson or Jaco Pastorius, the generally soft-spoken bassist has since emerged as one of the strongest new voices on his instrument, forging a personal sound full of lyrical expression, rhythmic clarity and harmonic sophistication. 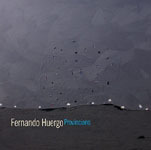 Living These Times, Fernando Huergo's debut recording, certainly is a case in point. Full of stylistic and atmospheric diversity, it is unified by its leader's resonant and vocalese tone, compelling compositions, and an equally adept cast of supporting musicians that seem to be at ease in any musical context. Being from Argentina, I wanted to combine more familiar styles like Afro-Cuban or samba with my country's tango or the zamba," explains Fernando about his desire to present a broader spectrum of Latin jazz, a conception surely influenced by the wide variety of artists he has worked and recorded with in the past – including jazz and Latin greats Danilo Perez, Dave Liebman, Tom Harrell, Claudio Roditi, Giovanni Hidalgo and Gilberto Gil – taking him around the world to Europe, South America and Japan. The jaunty Albiazul (White and Blue) opens the album with the celebratory spirit indigenousto the music of the northeast of Brazil, layering contrasting riffs over a propelling Baião, before kicking into a driving, blues-inflected samba. Exploring the extreme ranges of his horn, saxophonist Jacques Schwarz-Bart paints a pictures of emotional anguish on the haunting tango La Agonia Del Rufian Melanclico (The Agony of the Melancolic Mobster), framed by a melody of fragile simplicity. On The Reason Why We Don't Get Along, Brazilian vocalist Luciana Souza, flutist Anders Bostrm and saxophonist Ole Mathisen juggle motives of roguish dissonance and playful syncopation that spark extended solos by Fernando and pianist Alan Mallet. Listen to the bassist's unique accompaniment during the piano melody, tapping out the chords along with the bass line! Grazyna Auguscik's sensous voice sets the tone for Lejania (Farness), a relaxedly swaying composition of warm and pensive character supported by lush horn arrangements and the lyrical melodicism of the composers playing. Mallet renders another wonderfully breathing solo as drummer Ben Wittman delicately marks the time with his shimmering cymbal work throughout. Rhythmic punctuation and angular ensemble unisons determine the mood on the title track, Living These Times. Effortlessly alternating between swing and Afro-Cuban rhythms, the stage is set for some charged group interaction and fiery soloing by the tenor and bass. Zamba Para Jorge Y Emiliano was written as a tribute to the late Argentinean pianist Jorge Dalto and his Cuban colleague Emiliano Salvador – both key figures in the development of Latin music until their untimely deaths. Here Huergo can be heard on acoustic bass in a dialog of sober contemplation with pianist Mallet. Drummer Steve Langone stirs things up around the clave on the classic How High the Moon, which has been cleverly reharmonized and arraged as a Cuban rumba. Saxophonist Jacques Schwarz-Bart stretches out over the piano's pumping montunos and what can only be described as an independent counterpoint by the bass. 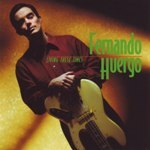 A simple descending motif becomes the seed for the pretty ballad Moonlight Over Somerville that features Fernando's singing fretless bass amid the pastel colors of Fernando Tarres' horn arrangements. Flutist Anders Bostrm's soulful playing throughout this record reaches soaring heights in an intoxicatingly lyrical solo. A childlike nostalgia reminiscent of a bygone summer seems to emanate from October, a slow samba quietly glowing with a muted warmth of a sunny autumn day. Again, a motif of graceful simplicity carried by the bewitching sound of voice and soprano saxophone is answered by a sinuous, chant-like Brazilian melody cycling leisurely around the slaps and pops of the bass' ostinato. Afterwards closes the album with a deceptive, yet extremely funky partido alto groove (a contemporary style of samba) centered around another poised solo by Huergo that easily belies any preconceptions one might – unjustifiedly – hold regarding the limits of the bass as a solo voice. Accompanying himself as well, his lines flow with masterful vocalese contour and harmonic imagination while Mallet's electric piano appears to pay a little nod to Herbie Hancock on the bridge.